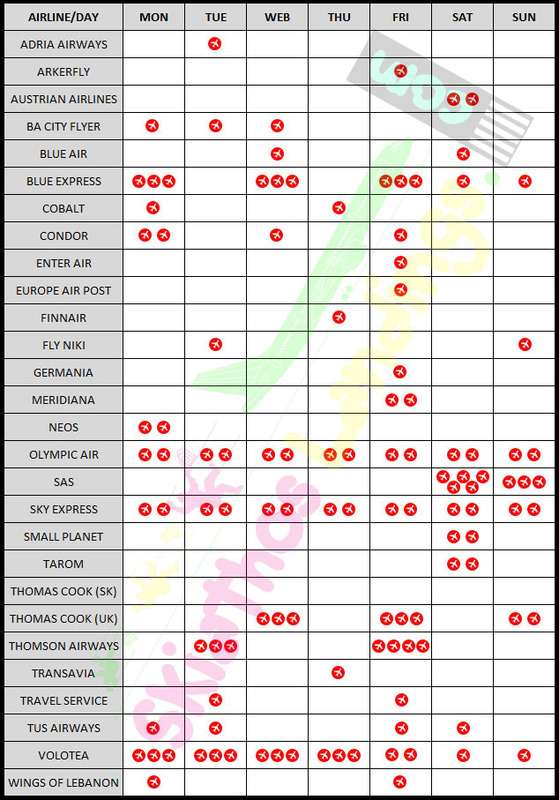 After many requests for more accurate, detailed and easy to read timetable of Skiathos airport, we are publishing the latest week actual flight schedule. By mid December the initial timetable for charter flights of summer 2019 can be found here. Expect many changes. Red are cancelled flights. Blue/Italic are pending for confirmation, possibility to operate. Green text are changes noticed few days before of the first day of operation etc. The following weekly timetable is based on peak season July/August. Flight schedule Summer 2017 by Airline/Weekly flights can be found HERE. Flight schedule Summer 2018 by Airline/Weekly flights can be found HERE (by early November).